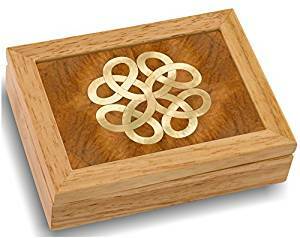 Jewelry boxes for men might sound ridiculous to some people, and you might think it unnecessary for you to get those kind of ‘things.’ On the contrary, it’s an essential that comes with a lot of benefits. Getting one allows you to safekeep your expensive watch or the beautiful love bracelet your girl got you for Valentine’s day. 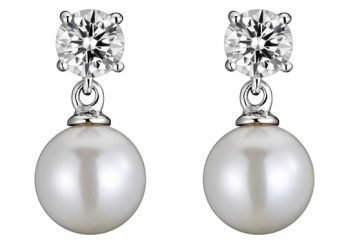 At the same time, you don’t have to worry about your jewelry getting scratched or being submitted to the whims of the elements. 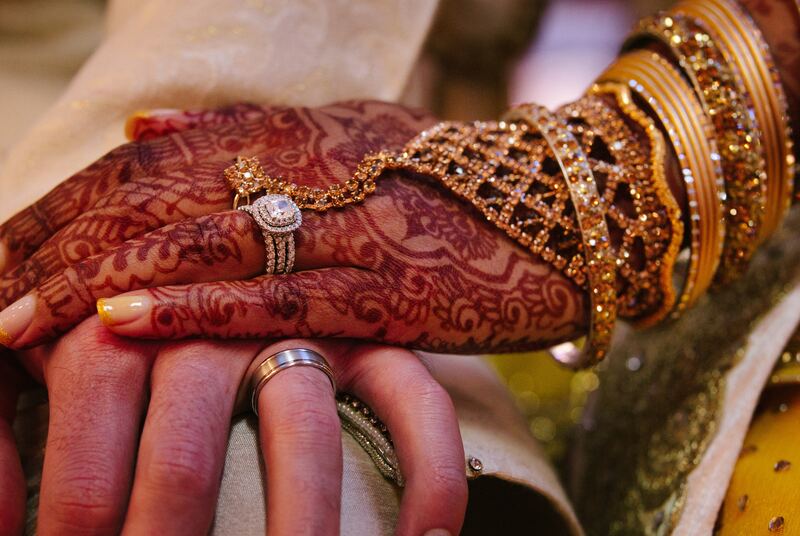 When it comes to men jewelry, not everyone has an extensive collection. But it is still important to be able to take care of your diamond-studded watch, or gold crafted bracelet. 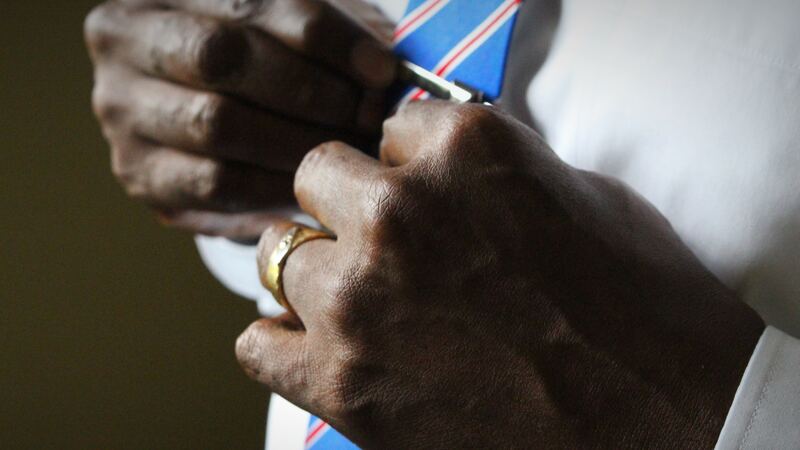 You don’t want to start looking for your cufflinks right before you go out for any occasion. And this is why you need to get a jewelry box. They are pretty great at helping you keep your jewelry safe. You can use them to arrange all your fashion pieces elegantly so that you know exactly where what is. The name jewelry box might sound a bit off, and you might have the impression that it is some silly old box that looks like a cabinet. Well, they look lovely; you can even choose one that suits the interior décor of your room. 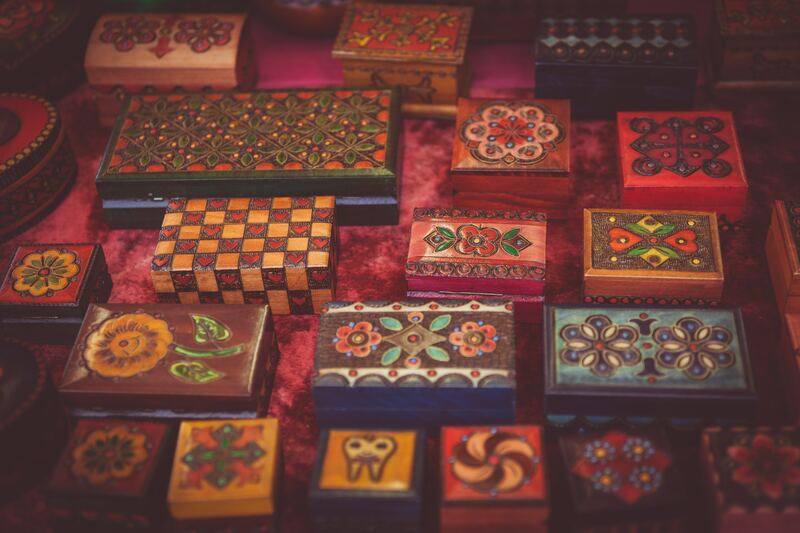 With a durable and lasting quality, there is no doubt that you’ll enjoy the convenience that comes with owning one of these jewelry boxes. 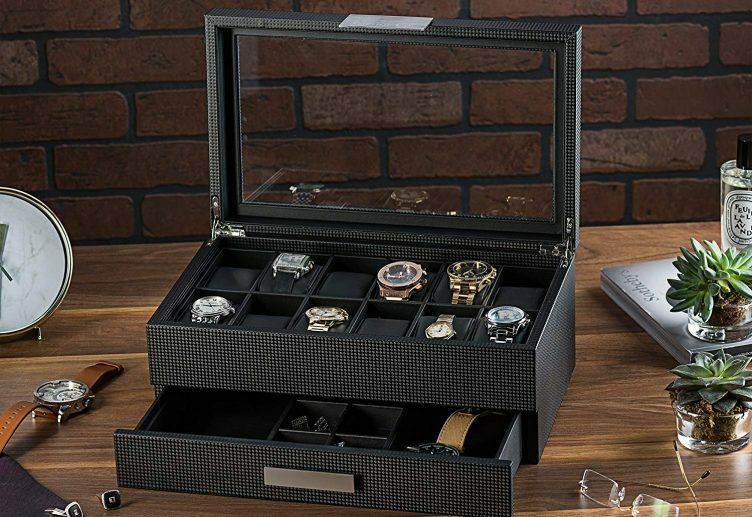 Here are 10 jewelry boxes, that were specially made for men. We picked from the very best on online stores and put up a little review to give you a heads-up about their awesomeness. Scroll through and check out the one that is perfect for you. This is one jewelry box that would make a great addition to a room décor. The perfect design is suitable to balance up modern styles and create a feel of sophistication for all your jewelry items. 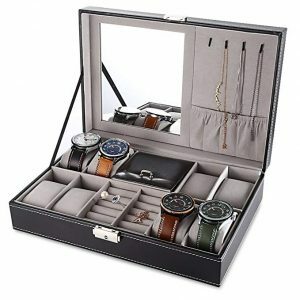 From watches to rings and even gadgets, you can arrange them all neatly inside the well-styled compartments. Made by Glenor, there is an artistic feel to the overall design of this box. It has a uniquely beautiful exterior that was made with carbon fiber. This can only mean that the durability is incontestable and high-quality materials dominate the entire covering. There are metal hinges to make it convenient to open and also a glass top so that you can easily see the jewelry you have placed inside even when you are not going out. Inside the box are 12 compartments which are very well lined with ultra-smooth PU leather. The walls are made of sophisticated stainless steel, and it also comes with a drawer at the bottom to provide more space for your accessories. You can keep your watches at the top, your sunglasses, rings, pens and even your money in the other compartments. When there is a balance of sophistication, convenience, and class, the result is a beautifully timeless piece that satisfies consumers. And this is what you have with their great box, you can get one for yourself, or buy it as a gift for your man this season. It comes in an elegant gift box and features a blank card to make it a perfect gift. One look at this jewelry box and you will be dying to get your hands on one. This is a box that comes with all the features that you need. It has a great design, well arranged pockets and is made with quality materials. All the details were crafted with outstanding workmanship, and you won’t be disappointed with this one. Made with premium PU leather, you can be sure that it is strong enough to protect your jewelry. It has a glass lid at the top to keep dust away and provide you with a great view, so you can quickly check out the watch you want to wear and pick it up. The dimension is 12.60″x 8.50″x 5.12″, and it will fit into anywhere you place it. Checking out the interior, it has six compartments for your watch, each of them with removable pillows, and about three for your sunglasses. All these spaces are lined with velvet to provide a cushion for your prized treasure. You can also relish the lock in the top layer to stop your kids from playing with that four-figure watch. 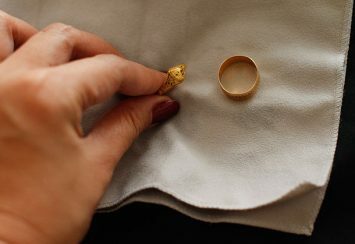 Other pieces like rings, necklace, and cufflinks also have a place in the whole package. For Christmas, Thanksgiving, Father’s Day or birthdays, this is a perfect choice for a gift. The price is also very affordable, and with the amount of stress it saves you, it is definitely worth every penny. You won’t need to dent your wallet for this one, just check it out with the link above. If you love pieces of jewelry, then you have to know how to keep them safe and secured, and this jewelry box can give you just that. You may have felt there is no need to get one, but with your rings and cufflinks rolling under the dresser often, you definitely need this. The design is amazing, and it provides such an aesthetic complement with your furniture. 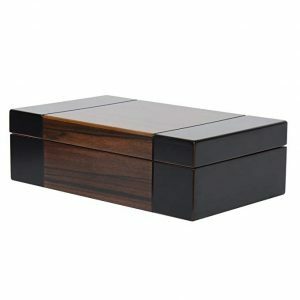 This jewelry box comes with hand-crafted leathery material, giving it a masculine finish. It has a glass top that shows all your pieces of jewelry in their glory. One unique thing about the design is how it slopes down with a curve in the middle to reveals two different sections. 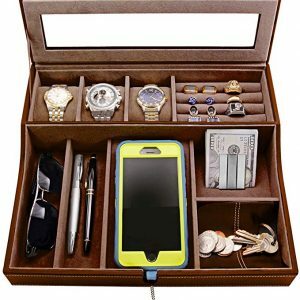 The top helps you to keep your watch, rings, and cufflinks, while you can store your money, phone and sunglasses in the front half. All the details were made to be stylish with convenience written all over it. One of the unique features added to this box that you will absolutely love is the phone compartment that has a charging notch attached to it. This helps you keep your phone safe and top up its charge at the same time. It looks remarkable on your dresser or nightstand as you’ll know where all your accessories are. For protection, each of the compartment is lined with a cushion, and there are little pillows for the watches. You can now have a safe place to throw all your stuff making them handy whenever you need to go out. Another bonus you get to enjoy with this item is that it comes with a heavy textured gift box, ready to be kept under the Christmas tree or presented during his birthday. Have you ever been late for a date just because you couldn’t find your watch or an interview because you can’t get your cufflinks from under the bed. Well, you can avoid all those delays when you get yourself a jewelry box. This remarkable piece of equipment lets you keep everything you need to accessorize in one spot where you can easily find them. This organizer was made with dark wood that looks like that used to make most of the furniture used in different settings. The color is aesthetically pleasing, and you can place it right there on your table or countertop. It is not so portable but quite efficient with a dimension of 12.1 x 8.1 x 5.1 inches and weighs 2.25 pounds in total. There are hinges by the side to make closing it easy, so that dust doesn’t get to your valuables. 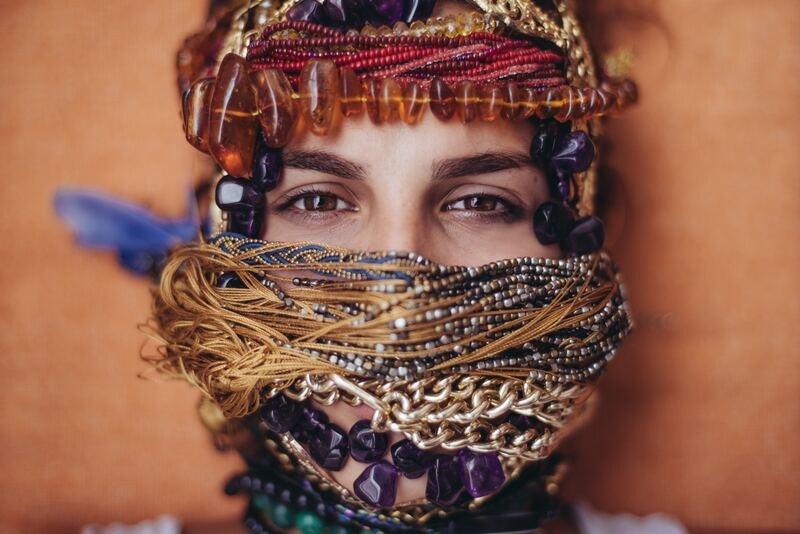 When jewelry comes in contact with eachother, there might be some scratching, and that would reduce how appealing they look. Inside this jewelry box, there are separate pockets divided by well-lined walls to avoid contact. It has four compartments for watches, one compartment for your glasses, necklaces or bracelets and another that can take several of your rings, pendant or cufflinks. You can choose to go for the dark wood or the brown color. Any of the two has the same design, they are only both available to select the one that goes with your other furniture. The price is really great, and you don’t want to miss the opportunity to get such wonderful deal. We decided to choose this fantastic item to be the next in this article. The dark valet box is an exquisite piece and was made with the best quality. This accessory will give your bedroom that elegance that you have been looking for. This gorgeous jewelry box was cleverly crafted using high-quality dark burlwood. The walnut finish is perfect, making it look timeless and classic. It has a total dimension of 11.2 x 7.8 x 4 inches, which makes it just about the size of a photo album. The weight is 2.25 pounds so you shouldn’t have any trouble moving it. There is a coin slide drawer where you can store you change. When it comes to the compartment and drawers, they are quite endless. 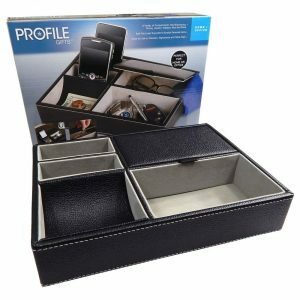 In the whole set, there are two compartments which can hold your phone, tablet, money, watches and any other jewelry. The interior of each chamber is well lined to make sure that your trinkets are not ruined. Mele & Co. offers optimum quality, so they are available to provide you with support. Check out the picture above, and you will start picturing how beautiful this will look on that table top. Get one from the link above, there is definitely a lot that you will get from it. If you are all about classic design and quality build, then you just might want to check out this beautiful piece of timeless work. 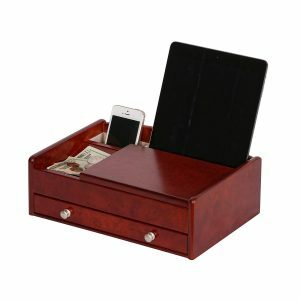 The jewelry box has an original feel and is made with unique components to give you the desired valued. You can use it to complement any design you have put together. 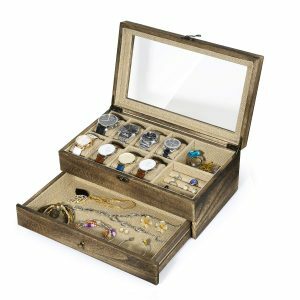 Its most remarkable feature is that you can keep your pieces of jewelry all in one spot with the well-arranged compartment. MarqART jewelry box was made with sturdy wood that is not only designed to last forever but also has an original work of art. There is a nice Celtic knot printed on the top of the lid making it the first thing to catch your eye. It measures just 4″x5″x1.5″ making it very portable and the wood has lacquer finish for a better look. You will get a label inside the package when you purchase one to explain the type of wood used for crafting it. The box is suitable for keeping a small number of your personal jewelry, but it does that pretty well. Inside the case is just one big compartment, but it has a velvet wall and bottom for support. You can also trust the hinges and the make opening the box very easy. When it comes to crafting original pieces of furniture like this product, there is a lot of effort that goes into it. And with the rubberwood used, extra care was taken to make sure the design was flawless. It is also perfect when you decide to send someone a gift. This is a jewelry box that has everything you want in one package. 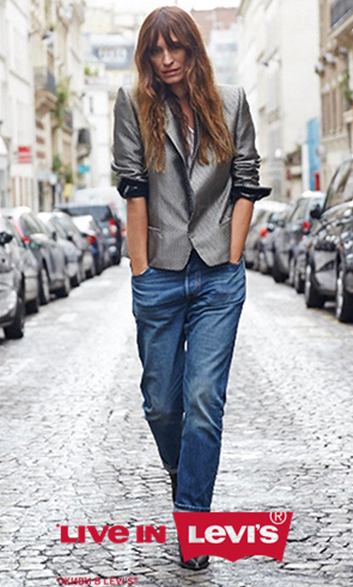 It is absolutely stunning and oozes with that needed extra that will get you charmed with just one look. Wonderfully crafted, this is one box that is multifunctional and still great enough to stay on your dresser without eating up all the space. 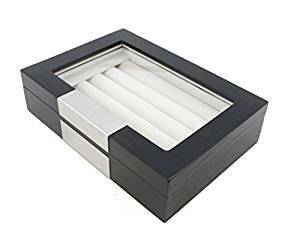 The exterior of this jewelry box is made with high-quality black PU leather. You can rest assured that it is highly durable and you won’t be needing another anytime soon. Measuring 7.09” x 5.51” x 2.28”, the box is pretty portable and lightweight at the same time. There are also added components like a lock, that will help you keep your jewelry secure anytime you aren’t around. Glimpsing the interior of the box, there is a mirror under the top lid, to let you catch how great you look with your cufflinks. You can also keep 8 of your watches, 4 necklaces, all your rings, and cufflinks and still have enough space to put your phone or wallet. The compartments are quite extensive, and each of them has velvet lined wall and bottom to prevent your jewelry from scratch or damage. Added to the fantastic service you get when you buy the box, you also get a 12-month warranty and money back. Just check it out, and you can get one for your dear one to celebrate birthdays, retirement, Valentine and even Christmas. 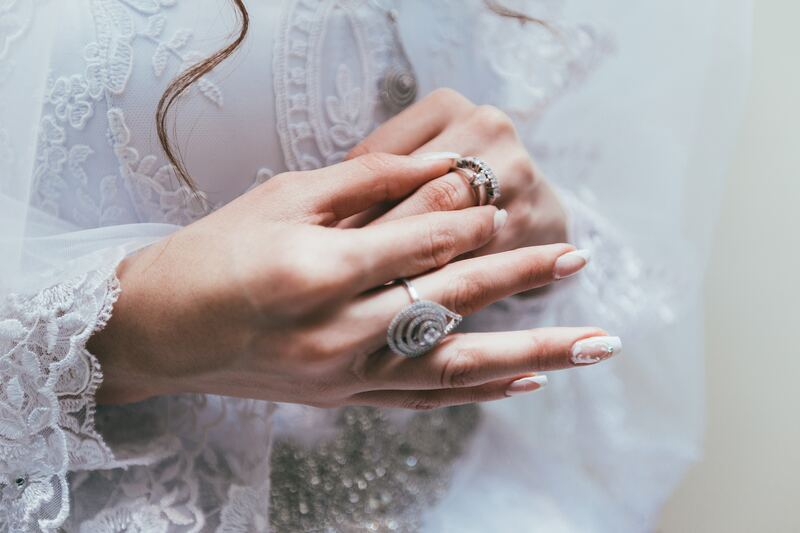 There aren’t so many ways to keep your watches, rings, necklaces and other accessories, safe other than using a jewelry box. You can choose from the various design available, and we have one here that will catch your interest. With its rustic finish and secure build, RooLee watch case has excellent benefits for you. The first thing you will notice as you take it out of the box is the sturdiness of the wood. It was made with a torched wood and rustic metal, making it very durable. You also get to have an addition of vintage style to complement wherever it is you want to place it. The box fits absolutely anywhere with a significant dimension of 12.8″ x 7.8″ x 5.2”. For a better view of your watches, rings, and cufflinks, there is a glass lid on the top of the box. 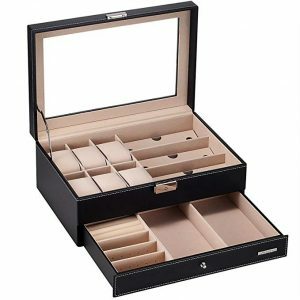 Even better are the inner compartments of the box, you have 8 slots for your watches, and the other slots will hold your rings and earrings correctly. There is also a large display drawer at the bottom to give you enough space to keep your other belongings. And like most of the other jewelry box, the interior of the box is all lined with multifunctional linen slots. Additionally, the box has a vintage metal clasp and removable pillows for the watches. Everything about this box is amazing, and if you don’t want one, you can get it for anyone around you that is pretty dear. The price is also affordable and great for the quality. If you love accessories with simple design that still has every feature you need, then check this excellent product out. It has about five compartments but will take different jewelry in such an arranged form you will know exactly where to look when you need them. It was created with leatherette and textured design to help you hold your phones, watches and even wallet. The dimension of the box is 10 x 7.13 x 2 inches, and its excellent for anything you want to arrange inside. You have two compartment measuring 3.38 x 1.5 x 1.75, another with 5.75 x 3.13 x 1.75 inches and the last two is 5.75 x 3.13 x 1.5 and 5.75 x 3.13 x 1.5 respectively. All of them have enough space for anything you want to put in. Its interior frame is carved with wood and padded with linen to make it anti-scratch. One of the compartments has a glass lid to help you keep anything you didn’t want to get dusty. The mix of color used for the box is a harmony that meets the eyes with intense beauty. To make the box lightweight, the whole set just weighs about 12.9 ounces and can be carried quite easily. You won’t need to worry about where to keep that expensive watch you just bought or that great ring you love wearing to dinner. The product is affordable, and you should know that there is no compromise on quality, meaning that you have the best at an excellent price. 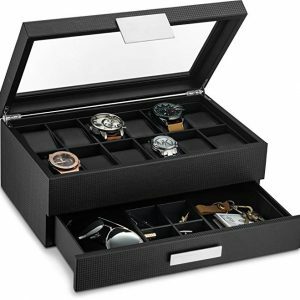 The predominant item in the men’s jewelry chest is usually beautiful wrist watches, cufflinks, and rings. And this is one chest that has all the space for you to keep them, with the gorgeous appearance and portable size, you won’t have any trouble liking the whole organization this box brings you. Made with top quality black wood, this box was crafted with first-class workmanship. You can bank on it to last you a lifetime. The box measure about 9.75″ x 6.25″ x 2.5″ and will fit your countertop, tabletop or dresser perfectly. Additionally, One of the perks you get from owning the box is the way it blends with other furniture’s or décor you have around the room. There are different compartments for cufflinks, watches and any other body jewelry. All these parts are well-lined so that you don’t have scratch marks on your valuables. You won’t need any manual or instructions since the box comes already assembled. Just buy it and start enjoying the many benefits immediately. You can also get one for your spouse, loved one, or friend to show them how much you really care.